Many years later, following my graduation, nothing changed much. Stayed with Royal Mail - family still dependent - and taught part-time. The ‘help kids in Africa' idea was far from defined - maybe I'd do nothing and the good intention would be forgotten. Then, after 27 years of marriage, my wife walked out. The children were now even more dependent but, of course, years passed and one by one they became independent. What do I do now? I know, I'll apply to VSO for a teaching post overseas. After two years teaching in Eritrea I had remarried. Rebka and I now have a daughter - I enjoyed breaking that news to my three other children, all now in their thirties - and it's the greatest pleasure watching her play with my grandchildren. We tried to relocate permanently to Addis Ababa in 2013. Big lesson learned - it's one thing living and working in a developing country alone, quite another with a child. How do I continue the work I started in Eritrea? How do I give my daughter the best start in life in a secure environment? Well, with one foot in the UK and one foot in East Africa there's a rare opportunity here. Build a home for my daughter in England and set her on the path to a decent education while simultaneously doing a spot of fund raising. Over in Addis Ababa in partnership with my wife's family set up a children's home, initially with my own savings, and grow this with any income I can generate from the fund raising. 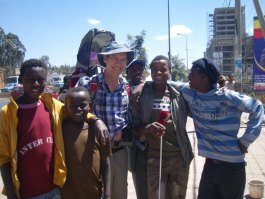 It occurred to me that I might be able to raise a bit by writing a book - hence Inside Eritrea - A Volunteer in East Africa. Appreciating that as a writer I make a good maths teacher, I've had a go. I've been flattered by the comments of critical friends not related to the quality of the text - which is questionable - but the fact that nobody believes that the accounts are from memory. I've never kept a diary in my life, the grey matter must still be intact. Although the book is presented in chronological order it wasn't written that way. Stuff was scribbled down as it came to mind and filed in the month it happened - and it shows! I appreciate that this makes for a disjointed read (apologies to the reader), but I am pleased that this approach means that you just don't know what's going to be on the next page. I didn't. The personal pronoun has also been dropped throughout. This was a conscious decision to keep the focus on Eritrea and Eritreans - not me. Obviously a bit of a challenge as the incidents are through Teacher Kevin's eyes, but that was the aim. Again, I appreciate that this doesn't make for a flowing text. A further aim was not to moralise, I'm not as secure in my standpoint as Barbara - formerly of the American Embassy in Asmara - who read a few chapters and couldn't resist shooting from the hip. ‘Nice balance Kevin but I want to put this to Isaias - every day people risk their lives to enter my country and every day people risk their lives to escape your country. When this changes I'll listen to your criticism of the West.' Fair point but no basis for constructive dialogue or a fruitful, progressive relationship. To really ‘get' the criticism, the suspicion, the animosity, surely you need to be a citizen of a country that has been colonised. The aim of this book has been primarily to show a little of the daily lives of people living under a repressive, brutal regime and make that lifeless body being hauled out of the sea real - that's Rahwa, I taught her at Mai Nefhi High School. She was a good student. The following was printed in my local paper and gives an overview of what the children's home is about - maybe you can help. Addis Ababa is a big city with about four million people and is very different to the African villages I have lived and worked in. There has been some development but there are still many people at the back of the queue. All kinds of websites can give you the unacceptable health and education figures for Ethiopia. Particularly outrageous are the child mortality levels here, which are still among the highest in the world. Getting to five years old is quite an achievement in this country. At night the lads climb into the corrugated iron shelter they have built on top of four stilts, as packs of hyenas scavenge around the city when it goes dark. 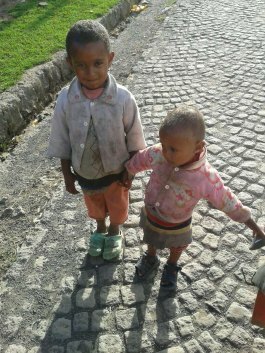 These are the kind of challenges children have to face in Ethiopia. And then there is the really serious stuff. Desiet holds a long grey rag to her nose as she taps on car windows begging with an outstretched hand. The rag has been used to wipe up spilled petrol on filling station forecourts as the fumes mask the pain of hunger. There are thousands of children on the streets of this city all clutching their stinking petrol-soaked rags. Does it get any worse? One of the things I have set up here in Addis Ababa is a small children's home - you need to start somewhere. It is a tiny place but it provides food and shelter for a few kids. Tsege is getting on a bit but she manages the day to day running of the place and makes sure the children behave themselves. Abel, Filimon and Daniel might be too proud to ask for hand-outs but I'm not. Simple request - if you can help with a donation that would be great. Born into a Derbyshire mining community in 1956, Kevin Morley graduated in Maths at Sheffield Hallam University and raised over £20k for several charities including Arthritis Research and MENCAP. He worked for the Royal Mail for over 25 years. After his children were grown he went to Eritrea to teach with VSO. He married Rebka and returned to the UK. He currently shares his time between the UK and East Africa, having set up Saltergate Children's Home in Addis Ababa.